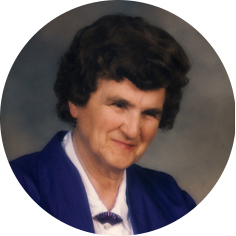 Margaret Fortman, aged 93 years of Moose Jaw, SK passed away on Monday, March 4th, 2019. Margaret was born on September 4th, 1925 in Mawer, SK. She was predeceased by her parents, Peter and Clara (Ask) Makaluk; infant brothers, Percy and Raymond; brother, Paul; husband, Bill Fortman; twin infant daughters, Marsha Ray and Debra Fay; and grandson, Travis Fortman. Margaret is survived by her children: Colleen (Craig) Lawrence, Susan (Dave) Foster, Dave (Brenda) Fortman, Brian (Linda) Fortman, Kevin Fortman, and Murray (Sherry) Fortman; daughter-in-law, Shona Fortman; grandchildren: Chad Lawrence, Curtiss (Tahrika) Lawrence, Christa (Luke) Ashworth, Courtney Foster, Autumn (Dustin) Lillejord, Donna Daley, Brandon Fortman, Hayley Fortman, Nicholas Fortman, Lisa (Trent) Huebner, and Chad (Tara) Isfeld; as well as 15 great-grandchildren. Margaret was totally blind since the age of 14, yet still managed to raise 6 children, bake bread and buns daily, and later in life hold down a full-time job at Churchill Park Greenhouse Co-op for many years, a job she really loved and she later became a board member for the Greenhouse. Margaret loved her grandkids and they all knew they could drop in at any time for a visit or food or whatever they needed. Christmas Eve was a tradition at Granny’s and was a family pot luck of epic proportions. Margaret lived life to the fullest and tried many things including cross country skiing, ceramics, macramé chairs, and knitting. Margaret and Bill lived on 3rd Ave NE for 53 years, then Margaret moved into Victoria Towers and later on to High Park Towers, where she enjoyed many a bingo and card game. Margaret was also a member of the Red Hat Society and a long-time member of Central Lutheran Church. The Funeral Service will be held on Monday, March 11th, 2019 at 11:00 a.m. in Moose Jaw Funeral Home. Reverend Doug Shepherd will officiate and interment will take place at Rosedale Cemetery. Margaret loved bright colors, especially purple, so please wear something bright to remember her! As an expression of sympathy, donations in Margaret’s name may be made to The Canadian National Institute for the Blind, 2160 Broad St, Regina, SK S4P 1Y5. Arrangements are entrusted to Moose Jaw Funeral Home, 268 Mulberry Lane. James Murdock, Funeral Director 306-693-4550. My deepest sympathy goes out to all the Fortman families. Your Mom was definitely someone to honour. Olga & I want to pass our since condolence to the family of Mrs. Margaret Fortman who losted her life in death. It was sad to hear Mrs. Fortman live her life in blindness. May she be bless to reserve a normal life in the coming resurrection as mention John 5:28,29. We were sorry to hear of the passing of Margaret. She was an amazing lady and was an inspiration to many. Our deepest sympathy to all of her family and friends. I know you will cherish the happy memories you have of her. Take care. Dave, Kevin, Murray and families, my sincere sympathy to all. May the memories hold you tight through this difficult time. I never knew your Mom but I certainly could see she raised well rounded boys to men. Blessings to all. To ALL the Fortman children, I am sooo sorry to hear of your moms passing. She raised some wonderful kids, how she did it, is still amazing to me. Even through her challenges, she could overcome anything. She is a woman that will always be impressive in my lifetime. Hugs to all of you, she will be missed. Our deepest sympathy to all of Margaret’s family. She and my mom were close friends for many years. May God grant you peace and comfort in this difficult time. My deepest sympathy to the Fortman family.Margaret was a wonderful loving lady and I admired her so much.We lived together on 3rd Ave. just a few houses apart for some 46 yrs. and our children played together and attended the same school.My thoughts and prayers are with all of you. Remember the good times and She will always be with you. Thoughts and prayers with all of you at this of sorrow. Sorry for your loss. I remember your Moms kindness towards me as a young boy. Sorry I couldn’t make it to her service. Margaret was a sweet woman with a quiet sense of humour. I remember her showing off some of her Red Hat accessories ..lovely things she had gotten from her family for her birthday. She had style.My sympathy to all of you at this sad time.May good memories give you strength. To the Fortman family, I am so sorry to hear of your mom’s passing. I just lost my mom as well, so I know what the next few weeks will bring. Margaret was an amazing woman, with a heart of gold, and raised a family second to none! Colleen if there is anything I can do, even just a chat, I’m right next door.